This season I’m making the switch from snowboarding to skiing. 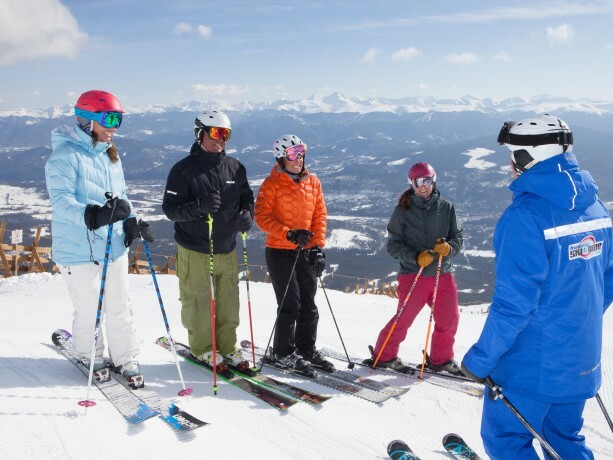 Though I feel comfortable on snow, I was looking for some assistance with my fundamentals and decided to try a day in ski school at Breckenridge. I was fairly nervous going into the lesson in the early morning. My memories of ski school as a child are all fairly traumatic and it’s remarkable how they resurfaced twenty years later. I convinced my husband to do a run with me before our scheduled meeting time to get all my jitters out; he subsequently took me on a run much harder than I wanted to do. After slowly winding my way down the mountain, I was successfully convinced that a day at ski school at Breck was in my best interest. Lessons meet on the snow at the base of Peak 8 outside the Kids’ Castle in front of One Ski Hill Place. I had a general idea of group ability levels before we arrived, but there were plenty of instructors prepared to talk me through which class would best match my needs. In the end I was between Levels 4 and 5 and decided to choose conservatively to make sure I was starting my season by focusing on the essentials. The class was small (just one other person in the morning and one other joining us after lunch) so I received plenty of individual attention. The lesson was geared towards comfortably and consistently making parallel turns. We began the day on the bunny hill, making several runs on the tow rope and more on Rip’s Ride. After lunch, we moved off the beginner chair and on to the 5–Lift. 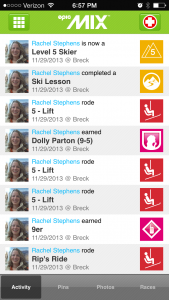 Our instructor, Nancy, has been skiing her whole life and has been an instructor for years. She was an expert and did a wonderful job passing her knowledge along. There was a nice mix of practice and discussion throughout the lesson. 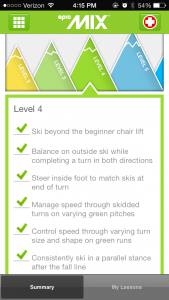 We’d start out each run at the top with a quick overview of the skills and techniques to focus on. We’d then work our way down the hill with real-time feedback and occasional stops for further dialogue or demonstrations. We focused on proper ways to distribute our weight, different turning techniques, and gaining confidence on the mountain. In particular, I enjoyed learning about using edges versus side-slipping in my turns. Apparently I was doing both to some degree, but it was nice to learn the specifics and practice them deliberately. I also liked the reminder about planning routes around the fall line; I intrinsically knew this from my snowboarding days but had never formally verbalized it. After we had wrapped up for the day we were able to log on to EpicMix Academy and see how we had progressed on all of the skills for each level. I ended up fully passing all the Level 4 skills and partially completing some from Level 5 in just one day of lessons.